While editing a moment ago, I came across this edit which was made by a user seemingly unrelated to the OP. The edit however added the full code that should have been in the question, which is fine in theory, however the code was never posted anywhere accessible to the editor, it is not in an image linked in the question's content, nor in the comments. Is the editor actually the same person trying to farm points from edits? As a side note, the given comment is ":D don't say thanks to me" which seems weird too. The code was posted by the OP, in an answer to the question. The answer is now deleted (see below), so you can't see it anymore, unless you have 10k reputation. So the suggested edit makes sense, but I don't know if it is enough to salvage the question. The OP also needs to provide an error message and/or stack trace. I agree that this is hard to judge for a reviewer. The editor could have made this clear in the edit summary (instead of :D don't say thanks to me), but (s)he probably thought this was obvious, because at the time of editing, the answer was still visible. 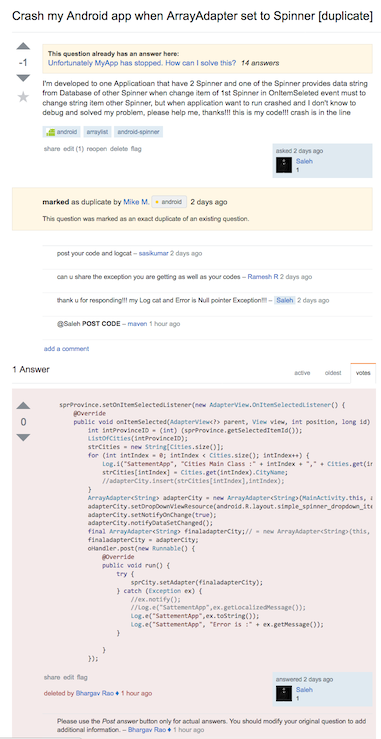 While you don't see answers when reviewing a question, you can't expect a <100 user to know this, and you would at least have been able to view the answer in a separate browser tab. That would of course be forbidden, but if (s)he intended to do that, it would have been easier to approve the edit right away (you can do this if you're the author of a post), instead of letting the review queue decide. Not the answer you're looking for? Browse other questions tagged discussion review suggested-edits code specific-edit . Did I correctly edit this question? Should you let users edit other people's answer to encourage downvoting? How to deal with questions asking for explanations of answers to other questions?